Synopsis from NetGalley: Cassandra fears rocking the family boat. Instead, she sinks it. Assigned by her English teacher to write a poem that reveals her true self, Cassandra Randall is stuck. Her family’s religion is so overbearing, she can NEVER write about who she truly is. So Cass does what any self-respecting high school girl would do: she secretly begins writing a tarot-inspired advice blog. When Drew Godfrey, an awkward outcast with unwashed hair, writes to her, the situation spirals into what the school calls “a cyberbullying crisis” and what the church calls “sorcery.” Cass wants to be the kind of person who sticks up for the persecuted, who protects the victims the way she tries to protect her brother from the homophobes in her church. But what if she’s just another bully? What will it take for her to step up and tell the truth? My Initial Thoughts/Rambling: In the first fifteen pages of the book, I thought this would be one that really spoke to me and become a new favorite. Instead, my ardor quickly faded into emotionless reading. It started out great, but didn’t end so well. Possible Spoilers Ahead. 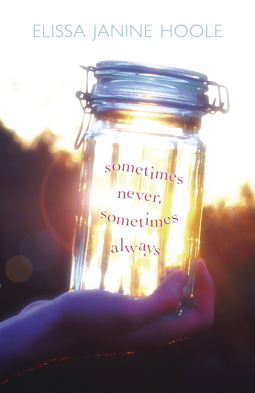 Disclaimer: I was given a free ebook of Sometimes Never, Sometimes Always from NetGalley in exchange for an honest review. What did I think about the characters? 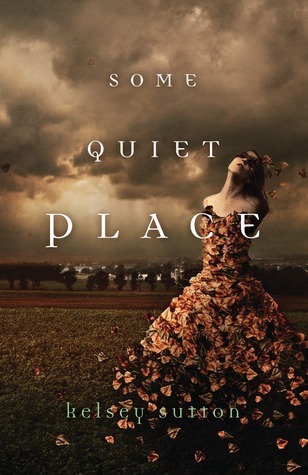 As the story progressed, I liked the main character, Cass, less and less. Every time she made a mistake, she justified it away. “I know this girl is really struggling with her weight, lack of friendships, acne, bad hair, and eczema, but it’s not really my problem, is it? Who cares if I join in on the bullying? It’s her own fault that she’s in this mess.” This, and other situations like it, are pretty much how Cass deals with her problems throughout the book. And she doesn’t really even start to change until the final ten pages – after 350 pages of her whining and illogical justification, it just wasn’t enough to redeem her. This is one of those books where the secondary characters are far more appealing than the primary characters. Eric, Cass’s brother, is caring, but he’s not afraid to call Cass out on the messes she creates. The same with Darin, the shy artist who sits next to Cass in English class. He’s adorkable. I love that boy – make that a new addition to the literary boyfriend list! I really wish I had been able to see more of Drew, what made her hurt so much and go down the path that she did. Plus, I wanted to know what happened after! She was like a thread that just dropped off and disappeared from the tapestry. And the concept and plot? The concept was good, what with the over-bearing religious parents and the girl who’s questioning her faith. As a Christian, I really empathized with Cass at first, because I know what it’s like to be unsure in your beliefs, and to have others judging you while you’re trying to figure it all out (just to make this clear: my parents were totally supportive while I worked my crap out). The first scene was the youth group debating secular books, and if they’re Satanic/evil/of the devil. I swear I felt my blood boiling within three seconds, because when I was in 8th grade (about that time period), I had several friends (and their mothers!!!) pull me aside and tell me that I was being lead down the path of sin and hellfire because I read Twilight and Harry Potter. Good times… Anyway, other than that, the rest of the book felt like it was dealing with a lot – bullying, suicide, homosexuality, religion, etc. I think if it focused on one thing and stuck with it, it would have been a lot better. As far as the plot goes, I enjoyed the story, but felt like it was too long and drawn out. After nearly four hundred pages, I felt like I had read a whole lot of nothing/Cass whining about her situation. Maybe if some extraneous scenes had been cut out, I wouldn’t have turned so sour against Cass and the rest of the story. What about the writing style? There wasn’t anything wrong with it, but it just seemed like Hoole didn’t have a strong theme/moral at the end of SNSA. With such a wide variety of heavy topics, I kind of expected to feel enlightened or uplifted at the end, but it just didn’t happen. If anything, the theme was celebrating yourself, in which case Cass was a hypocrite, because she does nothing but judge others. Anything else you’d like to add? Clearly, I didn’t like Cass. After that, it was really heard to enjoy the rest of the book. It had some great elements, and had the potential to be stunning, but it just didn’t pull it together in the end. Rating: 5/6 – I loved it! Synopsis from NetGalley: Crack your head, knock you dead, then Prince Harming’s hunger’s fed. Shortly afterwards, a beautiful girl named Luka shows up. She introduces Kenny to the backward glass, a mirror that allows them to travel through time. Meeting other “mirror kids” in the past and future is exciting, but there’s also danger. The urban legend of Prince Harming, who kidnaps and kills children, is true—and he’s hunting them. When Kenny gets stranded in the past, he must find the courage to answer a call for help, change the fate of a baby—and confront his own destiny. My Initial Thoughts/Rambling: My first thought when I started this book: I have not watched nearly enough Doctor Who for this. And then, isn’t that a paradox? Wait – can they do that? What are the rules of the mirror again? Ugh, my head hurts. BUT, despite the effort I had to make to keep all the wibbly wobbly timey wimey bits straight, this book was an incredible pleasure to read and I’m so glad I stuck through to the very end, because now I have a new favorite book! 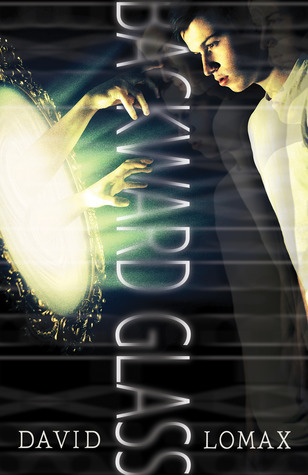 Disclaimer: I was given a free copy of Backward Glass from NetGalley in exchange for an honest review. What did I think about the characters? The best part about these characters was how real and tangible they were. Despite finding a time traveling mirror, none of them become swaggering idiots, believing themselves to be superheros. Kenny, the protagonist and narrator, recognizes this, and states it right out that he’s no hero – he’s just a teenager trying to figure it all out. Luka, while precocious and probably the most Alpha out of the entire cast, has her moments of vulnerability. There are so many kids from each decade, but all of them play a key role in the story and have stark differences in their personality. I never confused any of the characters with each other, because they were so well-developed and three-dimensional that there was no way they would allow me to mix them up. And the concept and plot? A+ for originality in concept. Between the mirrors and keys and Prince Harming and John Wald and the “auby one”, it was like an entirely new world was oozing from my Kindle screen. Remarkable world building, and a difficult concept explained very well! As an occasionally dense reader, I kind of forgot some of the rules of the mirror along the way while I tried to keep everything else straight, but Lomax always had a gentle reminder of what I had forgotten without being repetitive or pushy. Plot: All hail David Lomax for keeping such an intricate and very-easy-to-screw-up-if-you-get-one-tiny-thing-wrong plot all in line. Seriously, the subplots and alternate timelines and parallel worlds would have tripped me up within three pages if I tried to write them, but Lomax manages to balance all of them and wrap them up so perfectly at the end that I had a huge Chesire grin on my face when I reached the final page. And the foreshadowing was done just perfectly – I figured a few things out, but never too soon in the story. Plus, just when I thought I had it figured out, there was another twist that left me scrambling to find out where I had gone wrong! What about the writing style? At first I was a bit disconcerted, because (as you all know) I love a lot of description. There wasn’t too much of that, in the way of character appearances and setting imagery, but what I realized was that this story isn’t about the setting or appearances. It’s a coming of age story, and the really important parts are in the minds of the characters, and that’s what I really needed to pay attention too. So, applause to Lomax for making me realize that sometimes it’s okay, if not necessary, to forgo explicit detail and instead focus on the deeper aspects of the book. Anything else you’d like to add? I’ll be really honest: reading this book was hard work. It’s a lot of stuff to wrap your brain around, and it was a bit overwhelming at first just because you have to change your perspective from a linear path to one with branches and circles and twists and crooks in the road. Once I made that conscious switch, I started to enjoy the book a lot more. It was entirely worth it, and I highly recommend this book! I know that for myself I’ll be ordering a paperback copy for my shelves when it comes out next month.